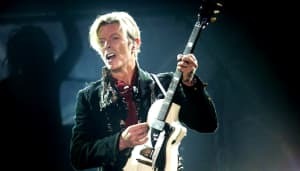 Ears perked up recently when David Bowie's longtime collaborator Tony Visconti talked to Rolling Stone about the making of the singer's next album. "We were listening to a lot of Kendrick Lamar," the producer explained. "We wound up with nothing like that, but we loved the fact Kendrick was so open-minded and he didn’t do a straight-up hip-hop record. He threw everything on there, and that’s exactly what we wanted to do. The goal, in many, many ways, was to avoid rock and roll." A 15 second snippet of another Bowie track surfaced today before the full song arrives at the end of the week. Look up here, I'm in heaven, the star sings over a bass-heavy groove. He adds a boast laced with menace: I've got scars that can't be seen. Listen above, and look for ★ January 8.